Which staff at your child’s school would recognize and assist an elementary student with prolonged sadness over his parents’ divorce? Or a teen who was struggling with anxiety about academic pressure? Just 38 percent of parents are very confident in schools’ ability to assist a student suspected of having a mental health problem, according to a September 2017 report from the C.S. Mott Children’s Hospital National Poll on Children’s Health at the University of Michigan. A release from the university notes that most parents (77 percent) are sure schools would be able to provide first aid for minor issues, such as bleeding from a cut. 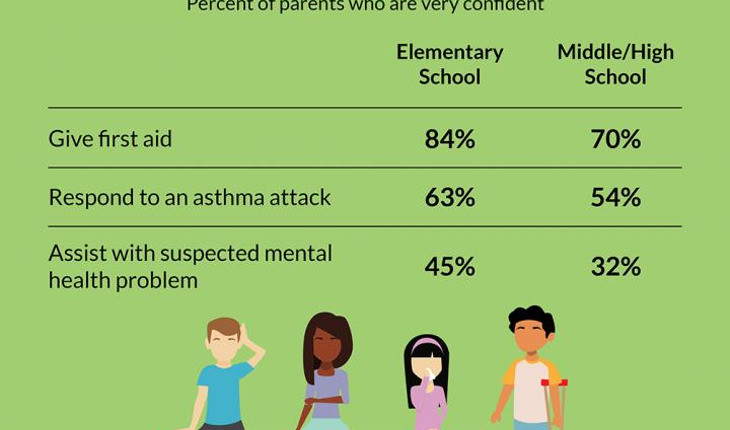 But parents are less confident about a school’s ability to respond to more complex health situations, such as an asthma attack or mental health problem. Parents at the middle/high school level noted that school counselors would be most likely to assist with mental health issues. Yet varying levels of training, competing demands and large student caseloads may make it especially difficult for counselors to develop relationships that facilitate the identification of students who are struggling, Clark says. “Parents may want to learn more about how their child’s school works to identify and support students struggling with mental health issues, and advocate for increased resources if needed,” she says. For basic first aid and urgent health conditions, parents name the school nurse as the staff with primary responsibility. Roughly 3 in 5 parents believe a school nurse is onsite at their child’s school 5 days a week (61 percent of elementary parents, 57 percent of junior/senior high parents). Parents who believe a school nurse is onsite 5 days a week report higher levels of confidence in the school’s ability to handle health and safety situations. However, recent data from the National Association of School Nurses suggests that parents may be overestimating the amount of time a nurse spends at their child’s school. Fewer than half of U.S. schools have full-time nurses, with substantial variation by region, according to the data. Assuming the constant availability of a school nurse may be particularly chancy for students with health conditions that may require an immediate response at school, such as administering a medication or knowing when to call an ambulance. “Parents of children with special health needs should work directly with school personnel to understand the onsite availability of school nurses, and to ensure non-medical staff are prepared to handle urgent health-related situations that may arise during the school day,” she says.